The Hunt - The Sydney Hunt Club Inc. If you are curious about hunting or require directions to a hunt property please contact the Secretary. On arrival, please make yourself known so that you can meet others and obtain any help. All riders need to be mounted to move off at 9:30am after the traditional stirrup cup of mulled wine. After speeches and the provision of information for the day, the hounds are cast and the Huntsman will set off with other staff followed by the Field Master and riders behind him or her. The hunt involves a lot of x country riding and riders will have the choice whether to jump panelled fences of varying height or opt for the gates. There are members who are unable to jump, so if you are not comfortable jumping, there will be no pressure to do so. We always ensure an experienced hunter is available to assist new members during the hunt. There is a broad spectrum of riders who attend from 4 to 84 years of age so while some will stay up front, you need not panic about being left behind! Depending on conditions, the hunt can last up to 4 hours with many breaks - it's not all fast! Riders are welcome to retire from the hunt earlier with the permission of the Field Master and in the expectation that protocol is followed in the interests of the safety of horse & rider and respect to the property owner. 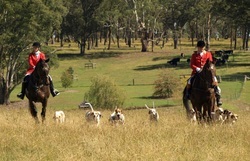 At the conclusion of the hunt and after horses are cared for, riders are welcome to join the group for lunch. Aside from opening and closing meets, people bring their own. We have a great time socialising and it's an excellent opportunity to reflect on the day. Hunt fee's vary depending on need. Most people purchase a season pass while others intending to hunt just once during the season may pay a casual one day fee. Please see the Membership page for more information. 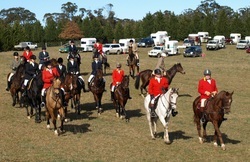 It is recommended that riders attending for the first time without traditional hunting attire wear jodphurs or riding pants, a collared shirt (with tie for men), riding boots and a black, navy or tweed jacket. All riders are required to wear an Australia Approved Safety Helmet. 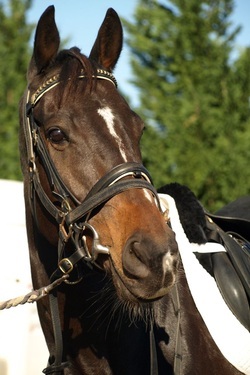 Your horse is also expected to be clean, tidy and fit with tack well maintained. When you decide to join the club and hunt regularly, traditional hunting attire will be mandatory and this is outlined below in "Etiquette". We look forward to welcoming you to our family, our club and our sport! When hunting in the field, there are a number of traditions that evolved over the years; some have to do with safety, some efficiency, and some are just good manners. As with most things in hunting, they all reflect common sense. Your adherence to these traditions will help make everyone’s day more enjoyable! Be punctual at the meet, start times vary for particular properties so check the program or contact a committee member. This means you need to be on your horse ready to ride by that time. Riders must have joined the field before it has departed. Ensure rider and horse are turned out in a neat and tidy appearance and the horse is sound. If you need to leave the field early, do so with the permission of the Field Master. Always respect the landowner and his property as you do as a guest in someone's home. This includes placing litter in your car for disposal when you have left the property. We are only permitted to ride at the venue on hunt day so please do not trespass on any days that the hunt is not invited. Sometimes there are crops so it is important that we respect them by riding along the fence line. You need to bring with you your own feed and water. Pay fee's to the Field Secretary before the meet. It is your responsibility to seek the Field Secretary and not wait for them to find you. Allow time to pay your fee and complete any waiver forms before the hunt. This includes any visitors with you - they are your responsibility to organise. Ride behind the Master and obey his or her instructions at any time. Horses can act out of character at times so please leave space between the Field Master's horse's heels or side. It is important to keep within sight of the Master to prevent riders getting lost. If you have trouble staying with the field please inform the Field Master or nearest Red Coat. 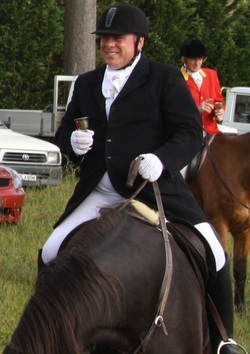 Hunt livery is an indication of seniority and those wearing it should be respected within reason. Junior members should always give priority to senior members. Committee member decisions or instructions should be respected as the committee are responsible to the members for a smooth and successful hunt. The hounds, Master, Huntsman and Whippers-In have priority and right of way at all times. It is important that you make way and prevent frights by turning your horse towards them. Make every effort to avoid getting between the Huntsman and hounds. Refrain from speaking to or interfering with hounds unless asked to do so by the Huntsman or Master. When hounds are working, it is important to watch quietly to allow them to do their job. When hounds are near you, be sure to turn your horse to face them to avoid the possibility of a hound getting kicked. Some horses will not be familiar with hounds and they are extremely valuable to the club. Never ride on the heels of another horse. At some point all horses will kick if run into or stepped on. If your horse is a known kicker, put a red ribbon on his tail, ride to the rear of the field, and remember that the red ribbon does not absolve you of responsibility if your horse does kick or misbehaves. If your horse refuses a jump, pull away from the obstacle immediately and join the rear of the field before attempting the jump again. Report damage of any kind or injuries to the Master immediately. Ensure that all gates are left as they are found. If there is any doubt you MUST contact the Master. If you sight a fox, attract the attention of the Huntsman or a Whipper-In as quickly and quietly as possible and indicate this by gesturing with your hand in the air pointing in the direction the fox ran. Remember that there is a rhythm to a hunt – if you disrupt that rhythm you can cause serious accidents. If your horse is misbehaving, move to the rear and away from others. If you must pull up, do not stop in the way of others still moving forward - in other words, move out of the way quickly. A bit of common sense goes a long way toward making the day safe and enjoyable. Australian Safety Standard Approved riding helmet (black). White, cream or buff coloured jodhpurs. Black long boots or proper riding boots (black or brown). White hunt stock or tie. Other Hunt Club Red Coats and Collars only after permission has been granted by The Master. Wet weather apparel as determined by The Master depending on conditions. Junior riders are permitted to wear official Pony Club attire. ipods and earphones should be left behind whilst hunting as all riders must be able to hear, take direction or react whilst mounted. Bring all water and feed requirements with you to care for your horse, out of respect for our property owners.